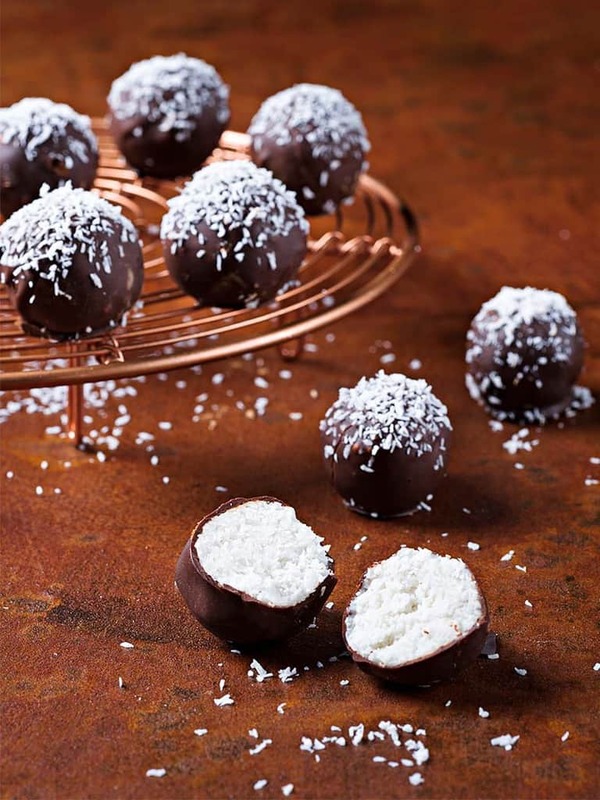 I love chocolate, and I love coconut and so it was only natural that I would combine the two to create these sensational chocolate coconut bites. They are just sweet enough to keep your cravings at bay, and because they are in little bite-sized portions, it is easy to monitor how many you are eating. Place the shredded coconut, coconut milk, coconut oil and honey in a food processor. Blitz until well combined. Line a baking sheet with parchment paper. Using your hands, take a small amount of coconut mixture and roll it into a ball. Place on the tray and repeat until all of the mixture has been used. Place in the freezer for 1 hour. Once the coconut bites have frozen, make the chocolate. Place the cacao butter in a plastic or heat resistant bowl. Microwave in 30-second intervals until the cacao butter has melted, stirring between each zap, and it has reached 105F - 113F. Sift in the cacao powder and stevia, mixing thoroughly to combine. Cover a cool surface with parchment paper, then pour the chocolate mixture on to it. Using a spatula, move the chocolate around constantly until it thickens to a toothpaste consistency. Return it to the bowl and microwave it in 5-second intervals until the temperature is between 82F – 93F, mixing between each zap to remove any lumps. Line a baking tray with baking paper. Remove the bites from the freezer. Cover the coconut bites completely with melted chocolate then sprinkle with shredded coconut. The chocolate will set quickly due to the cool temperature of the bites. Refrigerate for 5 minutes if required. The bites will keep in the fridge in an air tight container for several days. Place the desiccated coconut, coconut milk, coconut oil and honey in a food processor. Blitz until well combined. Line a baking tray with baking paper. Using your hands, take a small amount of coconut mixture and roll it into a ball. Place on the tray and repeat until all of the mixture has been used. Place in the freezer for 1 hour. Once the coconut bites have frozen, make the chocolate. Place the cacao butter in a plastic or heat resistant bowl. Microwave in 30-second intervals until the cacao butter has melted, stirring between each zap, and it has reached 40C-45C. Cover a cool surface with baking paper, then pour the chocolate mixture on to it. Using a spatula, move the chocolate around constantly until it thickens to a toothpaste consistency. Return it to the bowl and microwave it in 5-second intervals until the temperature is between 28C–34C, mixing between each zap to remove any lumps. Line a baking tray with baking paper. Remove the bites from the freezer. Cover the coconut bites completely with melted chocolate then sprinkle with desiccated coconut.